This easy Thai cookbook offers tasty recipes and useful techniques that will add a uniquely Thai flair to your cooking repertoire. Thailand's unique blends of hot and sweet, sour and salty, make its food utterly different from that of its neighbors, even though many of the ingredients are the same. In Thai Cooking you'll learn how to create over 60 of these delicious blends in your own kitchen--everything from fresh curries and tangy salads to pan-fried noodles and barbecued seafood. Simple step-by-step instructions, beautiful photographs and an extensive guide to Thai ingredients make it easy to prepare vibrant salads, delicious main dishes, refreshing drinks and desserts, as well as delicious sauces and curries. And, in addition to the familiar red, green, and yellow curries, authors Robert Carmack and Sompon Nabnian present an impressive array of authentic recipes such as Massaman, Penang and Hanglay curries. 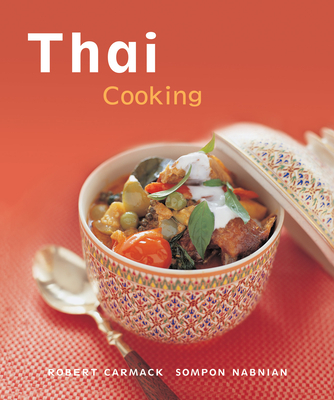 All the recipes are designed for home cooking, making Thai Cooking the perfect introduction to Thai cuisine. Robert Carmack, an American residing in Sydney, is a highly acclaimed television food stylist and writer. Carmack has worked closely with James Beard in New York and Anne Willan in Paris, and on Time-Life's celebrated The Good Cook series. Sompon Nabnian is an internationally renowned cooking teacher and the director of the Chang Mai Cooking School.